Provoking your end user to engage – likes, shares, favouriting, retweeting etc – is far from an exact science. The tsunami of information you are swimming against to be visible to your followers, and then to prompt an interaction from them, can be completely overwhelming. The most important thing to remember is not to be swept along with the ever-increasing flow, but to stay your ground and provide a safe and familiar, HUMAN, harbour from the information storm. Reaching out in this way will encourage your followers to grab on, climb aboard and shout out to their friends. 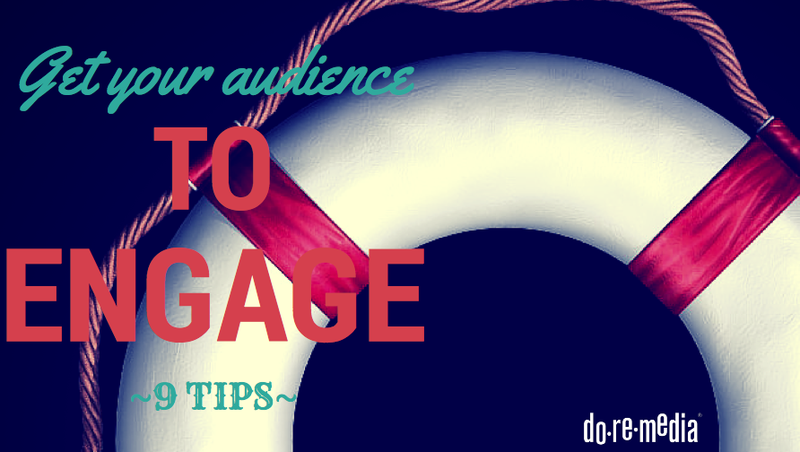 Here are 9 ways to get your audience to engage. !!! !NOTHING SAYS DANGER LIKE CAPS AND MULTIPLE EXLAMATION MARKS!!!! Caps are harder to read and therefore will reduce the effectiveness of your communication. Multiple exclamation marks (!!!) will create a similar disruption to readability and are therefore making your message less, not more, important. Information is a fantastic tool to attract shares from your followers. Aside from proving yourself a valuable resource, it allows your users to participate in the breaking news. Everyone likes to reveal that they are “in the know”. NB. Just be absolutely sure your information is credible! Set yourself a guideline, and limit, for how many posts you feel your audience will enjoy from your various platforms. Your aim should be to build presence, not prevalence. Use your statistics, notifications and reporting data to fine tune this. If you posted 8 times instead of your usual 5 on Facebook, how many of these posts were actually engaged with? Did you suffer any unfollows or unlikes? NB: Utilise Facebooks’ “Save Post/Video” function to build up a log of things you had to hold back on. This is also handy for that week when coming up with content is a struggle. Be supportive of your industry! Congratulate your competitors, customers, and suppliers when something cool happens to them. The benefit of this is that they are highly likely to share your post, assisting your reach to their audience. Tagging or hashtagging them in your post will make certain your goodwill is visible to them, and their network. Likewise, showing empathy for members of your industry or network when circumstances are stacked against them is an endearing trait to demonstrate to your followers, and often generates a “there but for the grace of god go we” type gratitude. Just be very careful with how you word these kinds of posts as they can easily sound backhanded. Providing a platform for discourse on global or political issues (choose those aligned with your branding and underpinning philosophies) ill almost always result in interactions. It can open up opinion sharing between members of your network, but be warned, things may become heated, and occasionally you may disenfranchise members of your network who do not agree with your POV. As long as you stay open to the freedom of speech to which both sides are entitled, you can end up with a pretty healthy thread. Share something personal from time-to-time. Put up some holiday snaps or pictures of your dog. The desire for intimacy is alive and well in the digital world. Even without directly inviting them to, your digital community will often be compelled to share their fur-kid snaps/favourite holiday destinations/ pictures of grandma. Give some comfort to your community with a happy story, an inspiring meme, or an act of kindness you encountered. A little bit of emotional something-for-nothing is always appreciated. Remind your customers you owe your happiness and success to their wonderful support. Mark anniversaries, achievements, and goals being met with thankyou posts. Tag as many friends and colleagues as you can. This not only spreads your notice of gratitude to each of their timelines, but being singled out from the swarm of faceless followers will make them feel extraordinarily loved. Follow these principles and you’ll be riding a wave of shares, like and retweets – promoting your business and growing your brand. Everyone interested in building an audience for your blog (including me!) should read this article!